Winger Stewart joined Watford from Charlton Athletic in a deal that saw Cliff Holton move to the Valley. He initially stayed for five years before moving up north to join Sheffield United. 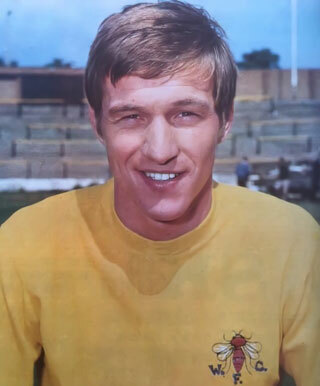 He returned to Vicarage Road in 1973 and spent another three years at the club before moving to play in the US. Now retired and living in Hampshire, Steward spoke to Watford Legends in 2010. Hi Stewart. Thanks for talking to Watford Legends. How did you end up as a Watford player? I was at Charlton for about six months as an amateur. I had a chance to turn pro with Watford and Charlton used me as part of a swap deal with Big Cliff (Holton). It was handy for me as I lived in Ruislip so it saved a trip across London each day. Pat Molloy was the one who instigated it. Ken Furphy was your manager then. Yes Ken was still playing at that time. He hadn’t been in the job long. He was only in his mid thirties then and so he was often playing behind me at full back. You scored a wonder goal against Manchester United. Yes it was a great goal. Everyone I talk to brings that goal up. 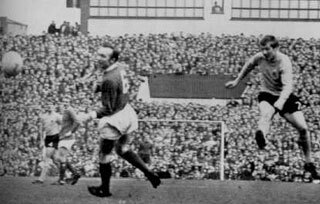 I suppose if you can’t play for Manchester United then you may as well play against them; and if you play against them then you might as well score against them! It was very nice. From your time at Watford were there any particular players that you enjoyed playing alongside? We had a good bunch of lads at Watford then, even though we were in the third division. I remember Tony Currie when he came along, I knew he wasn’t going to stay at Watford long – he was a very good player. As was Dennis Bond. They weren’t George Best’s or Dennis Law but they were good lads. Bert Slater was a bit older than me but really had some quality, as did John Williams who was as good as anybody else in the league. I always felt John could have gone a bit further in his career if he’s pushed himself a bit more. We have heard rumours that you and Duncan Welbourne didn’t get on. No! Not at all! When Duncan and I used to play together, and people were kicking the sh*t out of me, he would say to me “Scully, don’t worry about it mate. Leave them to me”. Duncan was one of the nicest guys. He was all heart, but hard as nails. Was Ken Furphy the best manager you ever worked under? No. But I will always appreciate that it was Ken who gave me my chance. The best manager I ever worked for was in America, and it was Brian Tiler. He was unfortunately killed in a car crash when he was travelling with Harry Redknapp in Italy during the 1990 World Cup. He was a great manager, always took the problems on his shoulders and away at from the players. He was an excellent coach. I also enjoyed working for Eddie Firmani when I was in the States. Unfortunately he never really got a break in the English game. How do you think you would do in today’s game? Ha ha! I can’t answer that. Only Joe Public could say whether they think I could cut it. What I would say is that it is a very different game now. I remember when we played we would have lunch at noon and we would have a steak. I think players would get shot if they were seen eating a steak before a game now! Also, how many true wingers are there now? Wingers in the literal sense that they stayed on the wing and provided for the strikers. Not many really. In my day every club had wingers, whereas now it’s more about having attacking full backs. The net result of this, I feel is that there are quite a few full backs out there who are not very good at defending. We’ve seen the clips of Ken Furphy giving the team talk whilst the players enjoyed a cigarette! Oh yes that was quite normal. Never touched them myself but many of the players enjoyed a fag. Even at half time they’d come in and have a fag and a cup of tea. It was quite normal. Did you have a game that was a personal favourite for you? I always enjoyed, as a lower league player, playing against the big boys, such as Liverpool and Man Utd. It was always a good marker of how good I was and good to test myself. You were up against players who earned a lot more money than you so it was good to see what they were like to be against. If you don’t mind us asking, how much were you on? In them days I was on £20 per week, with a £4 win bonus and two quid for a draw. I couldn’t say how much that was in today’s money. In context, Johnny Haynes was an England player and he was on about £60 per week. It’s probably a bit less than a Watford player now who will be on a good four grand or so per week! Is there a particular goal that was your favourite? It was a goal against Stockport where I beat a few men, and then a few more men and then slotted it in! What made you leave to go to Sheffield United? 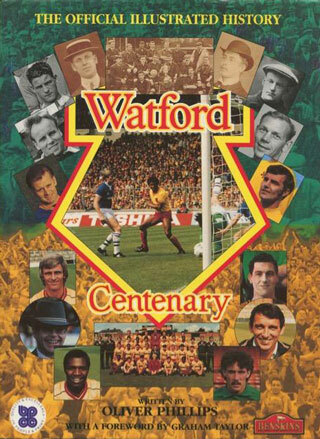 It was the year that Watford won the Third Division Championship. There was me, Barry Endean, Tom Walley and Keith Eddy. We were probably the four who were always starting each game, and we all felt we were worth a bit more money. We were told that we would have negotiations in the summer after the season ended. When we got around the table I was given a take it or leave it deal and I wasn’t very happy. We were a fiver a week apart and couldn’t do a deal. The other lads eventually got what they asked for and advised me to stick to my guns as I was looking for the same as them. In the end I think it came down to the manager thinking that I was a bit too much the ‘big star’. But I stuck to my principles and that was why I ended up going to Sheffield United. I don’t know and I don’t think I ever will! But it wasn’t all about money but I had a wife and two kids and just wanted to do the best for them. What made you come back to Watford from Sheffield United? I loved it up there and the people were great but my wife wanted to come back to the area. Also, Ken Furphy had taken over as my manager up there so I wanted to come back to Watford. I had the opinion that he’s tucked me up once over wages and I wasn’t going to let him do it to me again! Although that said Ken wasn’t a bad man. It was his job to get the best deal for the club. I broke my leg up at Sheffield and came back to Watford. Mike Keen was at the club by then. Why did you go to America? My knee kept swelling up after I broke my leg, so I wasn’t really fit. That’s when Mike allowed me to go to Florida to train with Eddie Firmani over the summer months. The Americans really looked after me and the family and I loved it there. And the football itself didn’t have the same pressure. So Tampa Bay Rowdies put a bid in for me and I was delighted to sign – well, it was hard not to sign when you’ve got all the sunshine in Florida! So why did you come back to Wimbledon?! I came back for the training really. I wanted to get fit through the American pre season whilst I was back. I did the same at Hayes the year after. And in America you went from Tampa to Portland. Yes we had a cup final against Toronto and it was one of those games where we could still be playing now and we wouldn’t have yet scored. We lost one nil. The management of the club were a bit ruthless and basically decided that the team was going to be completely overhauled. Brian Tiler then called and asked for me and another player called Clyde Best to go and join him there. Brian sold the place to me. Oregon in the North West is lovely, even though I was leaving the sun behind. The summers there are beautiful. What did you do after football? I used to go back to the States quite a bit to do some coaching but my main job was working in the baggage team at British Airways. I know they have their problems now but they were a great company to work for. It was a fabulous time in my life. I was in charge of a group of men and I enjoyed it a lot. Also working for BA enabled me to fly back and forth to see the friends I had made in America. What made you settle where you are now in Hampshire? My sons were getting older and had their lives in London, and my wife and I had always planned to finally settle somewhere with a bit of peace and quiet. I didn’t want to move again when I was older so I was looking for somewhere to be my last house. What are you up to day to day now? Very little, although my wife likes to keep me busy! I like to play a little golf although I’ve not played as much as I would have liked. I’m 64 now so I’m not looking to do too much. Well enjoy the golf. Thanks for your time! No problem. Ta da boys.